Writing comprehensive textbooks about globalization is an ambitious task. By now there are probably few authors who would attempt such an endeavour without having a specific focus. 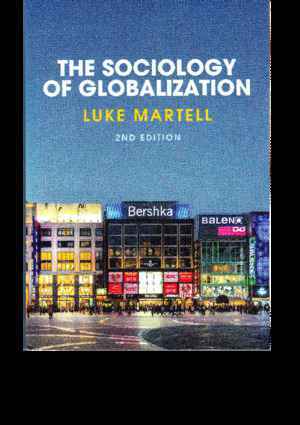 Luke Martell takes a disciplinary perspective as the title of the book suggests and includes topics that he thinks sociology should deal with in times of globalization. Those are not solely migration, social movements, and inequality studies – topics, Martell reckons, sociologists usually feel motivated by. He adds insights from history, culture, economics, and political science arguing that sociologists should engage more with these fields and look closer at institutions and actors shaping globalization. One could get the impression that there are only two kinds of sociologists. Those whose work can best be described as “unglobalist” contained in what Martell calls “static sociology” which is disparaged by the others, the “cosmopolitan sociologists” (p. 89), a division owing maybe too much to the volume by Held et al. 1999 logic of globalists and sceptics. Although the book does not deal with sociology itself, these discipline-reflexive elements are present; snippets of a greater story lingering between the lines, leaving the reader unsatisfied with a somewhat tainted perception of contemporary sociology. Comparing the origins and developments of different sociologies, such as in the US where sociology started after WWII with a focus on empiricism while in France it was oriented towards philosophical-theoretical thinking, could feature in that story. Looking at it from a different spatial angle and highlighting particular places like Chicago or Frankfort would spark discussion. Maybe it would even give rise to the question if the one or the many sociologies were subject to convergence, divergence or uneasy discernible border crossing academic entanglements under the global condition. However, that is not the story that Martell presents. All he asks for is sociologists to be somewhat more open and to include formal political institutions in their inquiries to help understand economists and political scientists what holds the world at its innermost folds. The author’s quest to embrace interdisciplinarity explains the presence of chapters dealing with the history of globalization. Text books about globalization at this day and age need to include statements about when the author thinks globalization unfolded first. Martell sticks to “recent and contemporary globalization” which he dates to the time following the 1980s. He advocates thus the prominent idea that globalization emerged following the end of the Cold War, equalizing the change of the world order with the beginning of globalization. The academic value of the book, however, lies in the readiness of the author to not be dogmatic about it. Two short chapters dedicated to historical approaches with alternate beginnings of globalization are testament to this. Martell chooses to extract Wallerstein’s as well as Frank and Gills’ world system theories as well as Janet Abu-Lughod’s theory of eight overlapping circles of long-distance exchange between Chinese, Indian and Islamic worlds and Europe from the abundant literature of historical works that exist. His periodization of pre-modernity before 1500, early modernity till 1800, modern industrialism till 1914, the two World Wars till 1945, late modernity till the 1980s, followed by contemporary and recent developments – all important phases in the history of globalization, he reckons, might be familiar to most in Europe and North America. Martell summarizes that pre-modern globalization was rather regional than global, because it did not extent to all sections of the population, lacked consciousness among people and economic interdependency was rather episodic and intermittent. He explains that “Western expansionism” such as the “voyages of discovery” by Columbus in the fifteenth and sixteen centuries extended over greater distances than Asian empires and were thus more global (pp. 33-39). This assessment follows the logic of understanding globalization as having to cross great distances; reaching as far as possible and therefore giving it to the Europeans to have started these developments. The second part of history is related to conventional discussions about capitalism and modernity, both presented as singular concepts. That is somewhat inconsequent as later in the book there are references to varieties of capitalism and multiple modernities. Emphasizing the plural more than the singular could have strengthened the intention of the author to embrace multi-perspectivity. It might have been harder, however, to present globalization as one process. The sections on history are brief, but existent in this text book which is highly laudable and a sign of the general acceptance of non-contemporary dimensions in globalization. In two chapters Martell deals with culture, another field that does not receive sufficient attention in textbooks about globalization. He starts with telephone and mobile subscriptions, continues with changing consumption patterns in cinema and TV and finishes with news agencies. He reasons that cultural globalization is steered predominantly from big companies located in the US, the UK, Germany and Japan. He does not consider these processes as genuinely global (p. 72) and argues that it is rather of an export character with a lack of truly global content. Several times Martell indicates that there is competition from elsewhere as for example through the news channel Al Jazeera or national TV programmes outweighing international productions. These remarks seem to be made in passing, however, and leave the impression that they are anomalies in an irrefutable narrative. Mentioning examples such as Bollywood in the second half of the 20th century, discussions about its role as emancipatory aesthetic form and main source of modern, independent Indian imaginary as Arjun Appadurai described it and acknowledging its appeal in many parts of the world could have altered the story. Greatly successful movie productions in Africa known as Nollywood and the rise of Turkey being second only to the U.S. in production and global distribution of TV dramas are examples that if further elaborated upon provide material for alternative views; multiple ideas of cultural globalizations, instigated from different places simultaneously. Globalization is presented as binary: Either causing convergence, homogeneity, and inequality or generating divergence, hybridity, and opportunity. Martell sees globalization as being dominated by a somewhat arbitrary western realm and as having the same dynamics when looked at through different disciplinary lenses. He continues to support the view that the world is triadic, but then, it might only be the view of one scholar who lives in a “rich, developed country, one of the core powers of the world, and relatively democratic, peaceful and free” (p. 2). This methodological disclaimer Martell adds at the beginning of the book is highly important for writers whose audience might be just anywhere in the world. This book is a second edition, launched seven years after its first publication. This can be felt as the underlying global political background is that of a financial crisis, multinational companies and China rising rather than resurfacing nationalism, digital political engineering, cryptocurrencies and a China that has outperformed the US economically (if not in GDP, but in purchasing power). With another decade’s end in sight, critics might find the developments in globalization insufficiently updated. The volume might best be classified as globalization understood interdisciplinarily by a single author in the first decade of the 21st century. Notker Hammerstein / Dirke Heirbaut, Sozialwissenschaften, Geschichte und Rechtswissenschaften, in: Walter Rüegg (eds. ), Geschichte der Universität in Europa, Bd. IV: Vom Zweiten Weltkrieg bis zum Ende des Zwanzigsten Jahrhunderts, Munich 2010, pp. 334-343. Arjun Appadurai, Indian Popular Cinema in the Making of a Decolonized Modernity, 5 November 2015, Conference “Global Modernisms: Contiguities, Infrastructures and Aesthetic Practices”, Haus der Kulturen der Welt, Berlin. Sevda Alankuş Eylem Yanardağoğlu, Vacillation in Turkey’s Popular Global TV Exports: Toward a More Complex Understanding of Distribution, in: International Journal of Communication 10 (2016), pp. 3615-3631. Claudia Baumann: Rezension zu: Martell, Luke: The Sociology of Globalization. Cambridge 2017 , in: Connections. A Journal for Historians and Area Specialists, 05.10.2018, <www.connections.clio-online.net/publicationreview/id/rezbuecher-27161>.